This is a challenge. And a big one. Never before have I been in charge of an NFL franchise in a simulation game. Yet here I am, trying to lead the Miami Dolphins to Super Bowl glory on Front Office Football Eight, a game I have never played before. This is going to be fun. I am a bit of a whiz on Football Manager. I’ve played the game for around two decades but am bored of it. There’s only so many times I can continue leading Manchester United to glory and when I have tried being a Stoke or Swansea, though I have done well, it just isn’t the same. With my love for the NFL growing, and after getting bored of playing Ultimate Team on Madden, I wanted to dive into a new challenge. One that is fresh and would test my limited knowledge in American Football against my vast experience in video games. I think I have found such a test. While Draft Day Sports: Pro Football 2016 was fun, as you can see from my review, it wasn’t in depth enough for me and the fact that I couldn’t get fired meant that it would be a boring read, even more boring than this. Then I discovered Front Office Football. After one day of playing a trial version of Seven, I knew I had to get Eight. So I did. And that is how I became the new General Manager/Head Coach (despite Adam Gase still being here) of the Miami Dolphins. First things first, I need to have a look at my roster. It’s OK. But our linebackers are awful. God awful. Outside of Kiko Alonso, I am not happy with Spencer Paysinger, Koa Misi or Jelani Jenkins. I need to surround Alonso, or as I like to call him Alons, with better talent. That is the first thing I jot down on my list of things to fix. Second is guard. Laremy Tunsil is an excellent addition in the draft but we need better talent and depth. Ironically, these are the things I have been told I need to improve on so it’s good that my coaching staff agree with me on that. After we have our training camp, I look to bring in some talent. My plan is to build around Alons at MLB and pick up a Sam and Weak linebacker. While I would love to bring in a Luke Kuechly or Bobby Wagner, which would enable me to push Kiko outside, it isn’t going to happen. 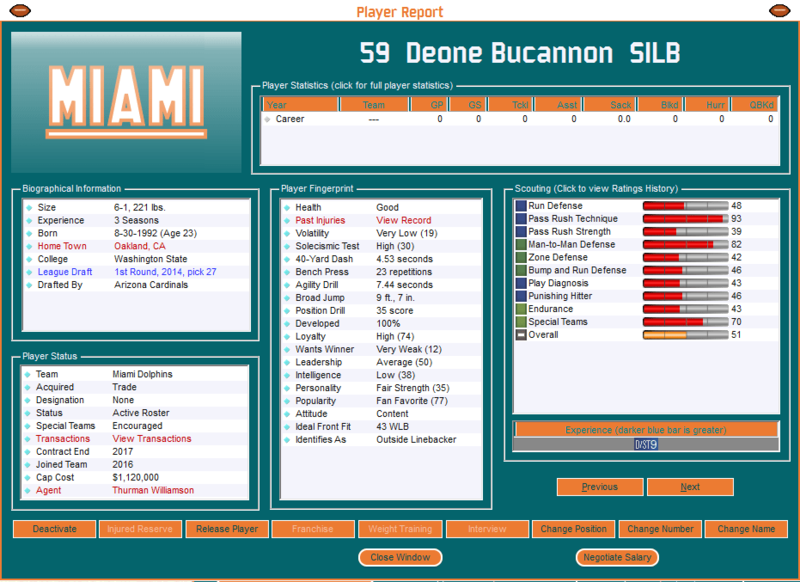 So I scout the league and realise I can pick up either Deone Bucannon or Manti Te’o. I spend hours, and I do mean hours, working out which one would have the bigger impact. Te’o is better against the run but Bucannon has amazing pass technique, 100 out of 100 to be exact. But then Te’o has 99 hit power and 94 play rec. In the end I decide to take a punt on Bucannon of the Arizona Cardinals. Now I like Bruce Arians, a man who loves to wear hats like myself, and he has built a nice little team down in Arizona. I want to nick a player off that team. The phone call is short and sweet. For a 2017 3rd round pick and a 2018 2nd, Bucannon is mine. Now I know that is losing some top picks, but Bucannon is a nice addition. Or was he? Now he’s in the building, I notice his stats aren’t as good. I hate my scouts. However, I am told I still need a starting linebacker. So I go back and pick up Te’o for a third next season and a third in 2019. I really don’t like third round picks do I? Next up is picking up a guard and that comes in the shape of free agent Roberto McNeil, who will instantly come in for rookie Tunsil. Once I have reorganised my depth chart and realise that Bucannon won’t see much playing time because Te’o is above him, I go grab a drink and call my mum to ask her why I took the job in the first place. She tells me to not bother her and turn the game off. That’s helpful. Anyway, we have our first pre-season game to prepare for and it is against the New York Giants. Now our game plan is simple, stop the run and get pressure on Eli Manning to stop him from having time to find Odell Beckham Jnr. When we have the ball, we need to get the ball in the hands of our playmakers, British Born Jay Ayaji and Jarvis Landry. I am optimistic we can start off the Simmonds era in Miami with a win. The game starts off really well, getting an early stop and forcing a punt. However, Giants punter Brad Wing’s punt is collected by Chris Culliver who returns the kick for seven yards before fumbling and Justin Pugh recovers on our 19. Remind me to take Culliver off returning punts. Three plays later and the Giants are seven up and I can’t believe I started this game. We get the ball and hand it to BBJA, what an athlete. He is picking up yards and so is Damian Williams, who is proving to be a great receiver out of the backfield. Now it should be noted that I am calling the plays at this point, mixing in pass plays with the run and keeping the Giants defence guessing. We get all the way to the red zone but are forced to settle for three. I’ll take it. We showed we can move the ball well down the field and I trust my defence to get another stop. And they do, in amazing fashion. Te’o gets a sack, a tackle and Paysinger follows it up with a sack of his own. Three and out, Miami ball please. Culliver returns the punt, pretty sure I banned him from doing that, but this time he doesn’t fumble. Again, BBAJ is a monster and Landry is starting to warm up. Tight end Jordan Cameron gains 28 yards on a play and before we know it we are back in the red zone. But again, are forced to settle for three. We should be 14-7 up but instead find ourselves 7-6 down entering the second quarter. Bucannon starts to make some tackles while Earl Mitchell picks up a monster sack on 3rd and nine to once again force the Giants to give us the ball. Starting on our 4, Williams runs the ball for 24 yards before Ryan Tannehill throws and interception. Dude, really? Luckily, Te’o and Cameron Wake bail him out by stuffing the Giants run game and they kick a field goal to go up 10-6. Our next possession comes to nothing and we kick the ball back and a few huge plays later from the Giants sees them score a touchdown. Just like that, 17-6 going into the two minute warning. It’s OK, a nice drive and we are back in the game. BBJA, Landry, Williams and Cameron are proving to be studs, making plays. Tannehill on the other hand, is proving to be a dud. With 15 seconds left of the half and on the New York 23, he is sacked, fumbles the ball and Keenan Robinson recovers the ball. DUDE, REALLY?! It at this point I kindly ask Adam Gaze to call the plays for the rest of the game as I need a long drink and he does a good job. Williams goes off on one, having a monster game and in turn becomes a serious contender as my No 1 running back. Te’o makes tackle after tackle, leading the team with four, before Alons takes over and becomes a tackle machine. He ends the game with eight. This is why I love this guy. Landry scores a touchdown early in the third to make it 17-13 and it stays that way going into the fourth. New York score a field goal with 11 minutes remaining to make the game 20-13 but on our next possession, we march down the field and Williams runs it in for a 21 yard TD. TIE GAME and seven minutes remaining. We can do this. No we can’t. Our defence has been magnificent all game and once again come up with a stop to force kicker Robbie Gould into a 53-yard field goal, which he makes with ease. And with 2:47 left on the clock, we are unable to mount another comeback. I’m sticking to Madden and Football Manager. I will not deal with turnovers. I hate them. I hate them. I hate them. We turn the ball over three times, the Giants don’t once. They fumble the ball twice but recover it both times. We get more first downs, rushing yards and passing yards. But it wasn’t enough. We lose by a field goal. I really wish I didn’t turn on the ‘allow team owner to fire you for poor performance’ feature. To add insult to injury, McNeil is out for a week, Paysinger out for two, DeVante Parker is out for two weeks (I don’t remember him touching the ball) and our starting corner Bene Benwikere has broken his foot and is out for six weeks. Seriously, can anyone remember where I put my FM17 disc?